D.J. Henderson is living the defensive lineman’s dream. He gets to run with the football. But it has not transported him from a weighty sense of responsibility as a former junior college player trying to make good with a new team in a different part of the country. The University of Idaho defensive tackle has scored two touchdowns this season as a fullback, and he nearly banged in a third against Appalachian State. He was stopped just short of the end zone on third down. “I actually wasn’t down. They called me down,” Henderson said. On fourth down, on a play for which Vandals coach Paul Petrino acknowledges second-guessing himself in a 23-20 loss, Idaho elected to kick a field goal. Improbably, Henderson also has a kick return, for six yards, against UNLV. As an up back, installed for his blocking, he scooped up a short kickoff and ran with it. Invested with a body designed for football, 6-0, 280 pounds and quick, Henderson says he can play defensive tackle, nose guard, defensive end, linebacker and on offense fullback and tight end. “They give me a task, they know I want to do it,” he said matter-of-factly. Linebacker might be a stretch, according to Petrino, but he concurs with the rest of Henderson’s list. 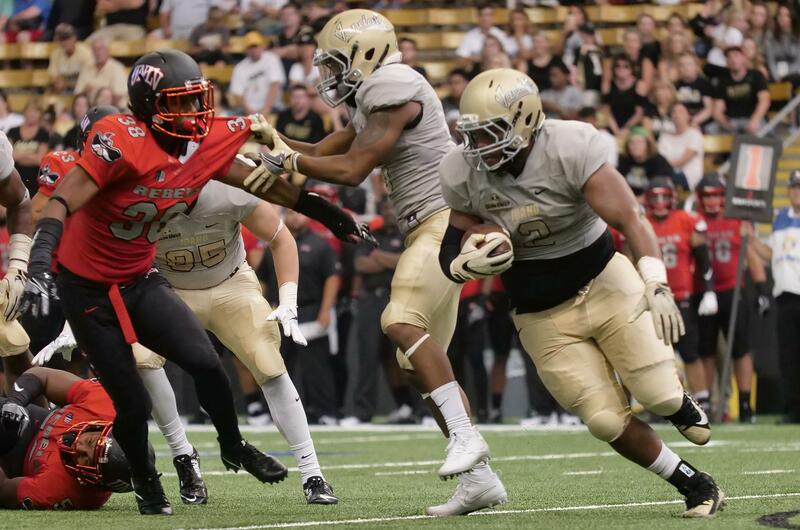 Last year, Idaho used senior defensive lineman Tueni Lupeamanu in goal line situations as a ball carrier, and during the first week of practice this season Petrino tried out Henderson in the role and saw similar prowess. Although an opportunity to carry the ball might encourage ebullience in most people whose primary role in football is the thankless duty to dominate the tight, violent spaces within the line of scrimmage, Henderson has a serious demeanor. Henderson followed fellow East Mississippi Community College alum and defensive lineman Akeem Coleman, last year’s Sun Belt Conference newcomer of the year, to Idaho. Raised in Clinton, MS. “a nice town, quiet,” isolated from the city of Jackson but close enough to be within its orbit, according to Henderson, he couldn’t have gotten much further from home and remained within the continental U.S. than by coming to Idaho. “I’m used to being on my own,” Henderson said. The biggest adjustment to Moscow is “the weather,” although he said he likes the Northwest. His goal after graduation is to follow in his mother’s footsteps and become a registered nurse. Although reticence is Henderson’s default position in most things, Petrino said he has seen him opening up, especially with teammates. Following a drill involving both offensive and defensive lines in practice this week, Henderson briefly shook hands with sophomore offensive guard Sean Tulette after Tulette battled to a standoff with another defensive lineman. “He’s come a long way already,” Petrino said of Henderson. Although he could possibly perform as Idaho football’s Swiss Army knife, Henderson sets his season goals as a defensive lineman “two tackles for loss, six sacks, 40, no, 50 tackles.” He has already hit his tackles for loss target, and through six games he has 12 total tackles and 1.5 sacks. Published: Oct. 19, 2017, 8:22 p.m.